Mggnitude 6.2 earthquake hit South Sandwich Islands region today at 09:54:55 UTC (07:54:55 AM Local Time). 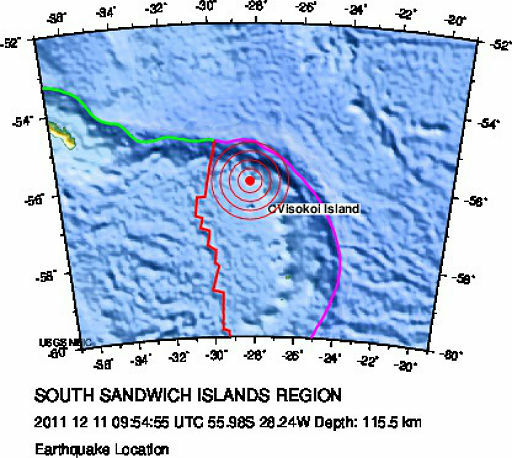 Epicenter was 104 km (64 miles) NW of Visokoi Island, South Sandwich Islands and 354 km (219 miles) NNW of Bristol Island, South Sandwich Islands (55.980°S, 28.238°W) with depth of 115.5 km (71.8 miles) according to USGS. Magnitude 6.1 was recorded by EMSC with depth of 128 km (79.5 miles). There were no casualties because the islands are only populated with birds. South Sandwich islands are Sub-Antarctic volcanic islands. The South Sandwich Islands are a group of volcanic islands in the southern ocean. They are a Volcanic Island Arc, made up of volcanoes on South Sandwich Microplate, a small tectonic plate between the South American, Scotia and Antarctic Plates. 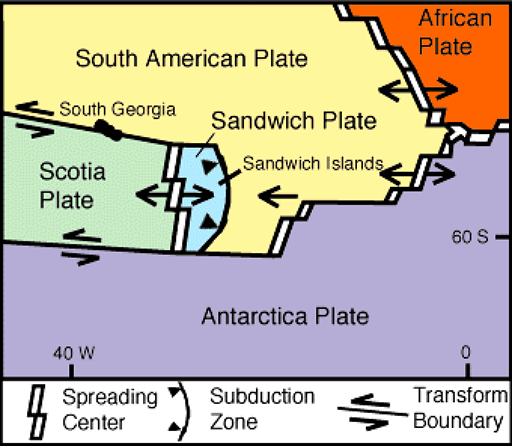 The South American Plate is being subducted beneath the South Sandwich Plate, as this happens rocks from the plate are drawn into the mantle of the Earth, where they are melted by heat from the Earth's core. Lighter material then rises up through the overlying South Sandwich Plate, where it is extruded at the surface, forming basalt volcanoes.